Despite poor weather conditions, crowds of onlookers and supporters headed for the Manx Electric Railway Station at Laxey, as part of an eight day extravaganza enjoyed by both local and visiting enthusiasts. 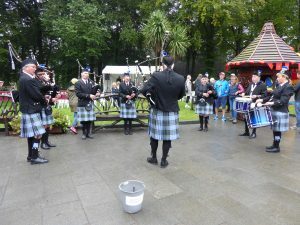 The day-long celebration included a variety of live entertainment, fairgroun d rides, stalls, memorabilia and an opportunity to explore the Laxey Car Shed. But the main attraction of the afternoon was a unique trio of vintage transport referred to as ‘the three 1s’. The line-up brought together the Manx Electric Railway Car 1, the Snaefell Mountain Railway Car 1 and the Douglas Bay Horse Tramway Car 1 for a great photographic opportunity. 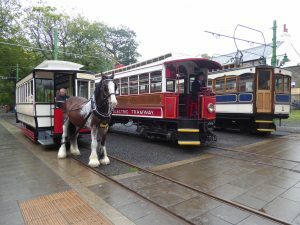 Tram horse Douglas was brought specially to the village and several bystanders got into the spirit of the occasion by donning Victorian costume. 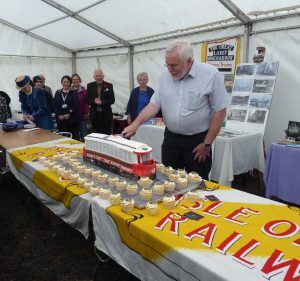 An extra treat for onlookers was the cutting of a special anniversary birthday cake by the Director of Transport, Ian Longworth, in the marquee, with slices of cake passed amongst the crowd. 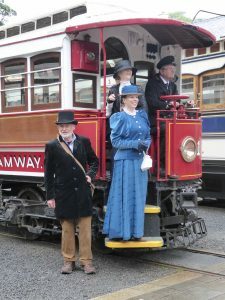 There was also an opportunity to travel on a range of trams, enjoy cavalcades and take the controls of an electric tram with Motorman Taster lessons during the week. The Lieutenant Governor, Sir Richard Gozney, also unveiled a plaque to mark the 125th anniversary at Derby Castle. ‹ Manannan’s Winterfest – A Magical Manx Christmas!